“Most of our neighbors suffer from significant flooding when it rains,” said Schmid Principal Andrea Black. The Space to Grow design team took this into consideration and created a “runnel”—a small man-made feature that captures rainwater from the school’s roof and feeds it into a garden that’s ready to soak up all that water! But the schoolyard transformation doesn’t only address the flooding issues, it also provides a safe and fun place to play and learn with features such as engaging play areas and an edible learning garden provided by the Kitchen Community. “This year we have a significant focus on being healthy and active. Our PE instructor will utilize all those fields and courts … Science teachers will be encouraged to use the space to teach botany and the water cycle,” said Black. 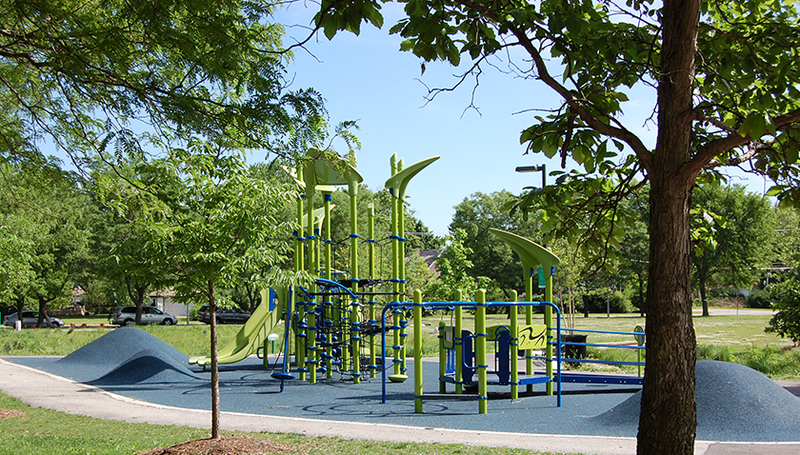 “Everything on campus will be utilized for understanding and to promote healthy activities.” And, because Schmid is deeply connected to its neighborhood, the schoolyard is used not only by students, teachers and staff, but also by community residents who can be seen playing on the basketball courts on weekends.